Last Fall, my local quilt guild began making Quilts of Gratitude for our brave wounded soldiers. 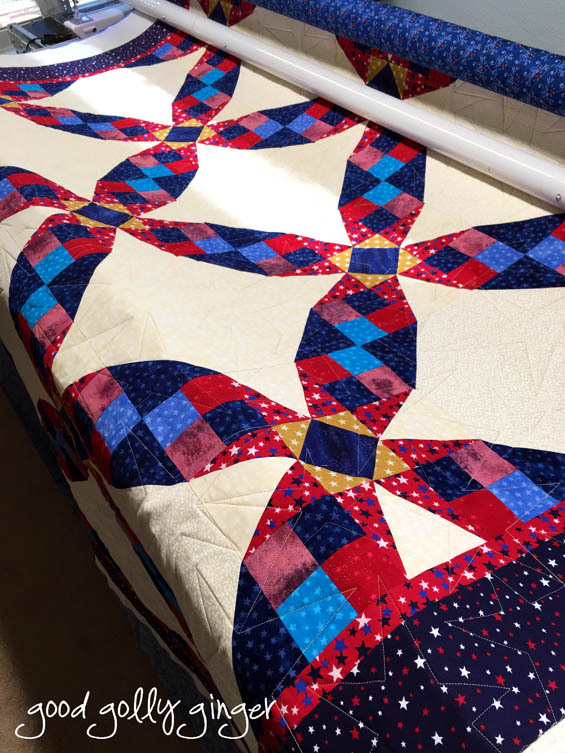 These quilts were donated to men and women at our local Air Force Base hospital as they received treatment for injuries. I am proud that our guild donated these quilts, and I quilted all of them. 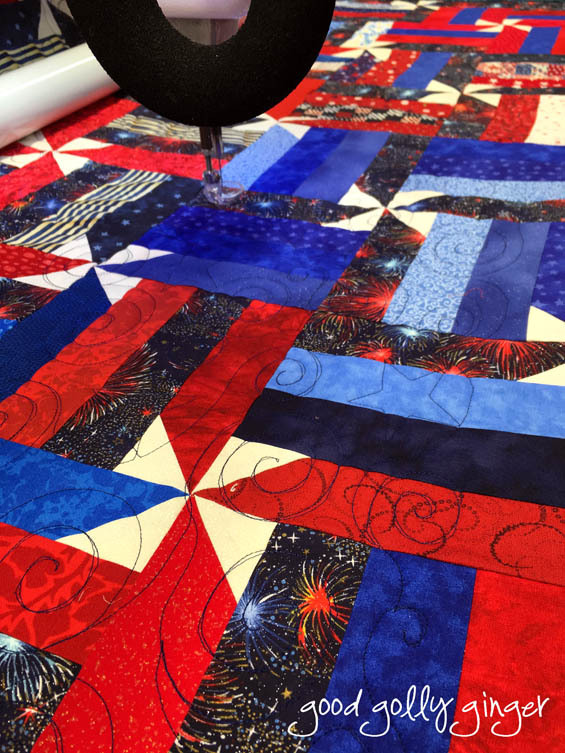 The first gorgeous patriotic quilt was pieced by Carol. 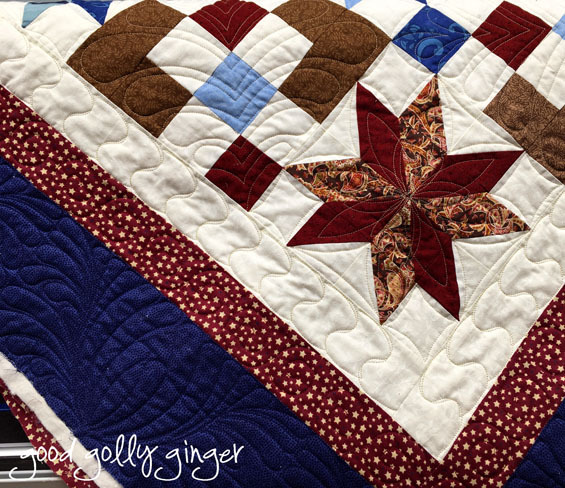 I custom quilted each block with modern stars, wavy stripes, or a single star. I loved the pieced backing too. The following quilt was pieced by all the members of the guild. JoAnn put it all together, and I quilted this one with navy thread and a graffiti style pantograph in swirls and stars to echo the firework fabric. This quilt was also pieced by the entire guild, and Meda put this one all together. 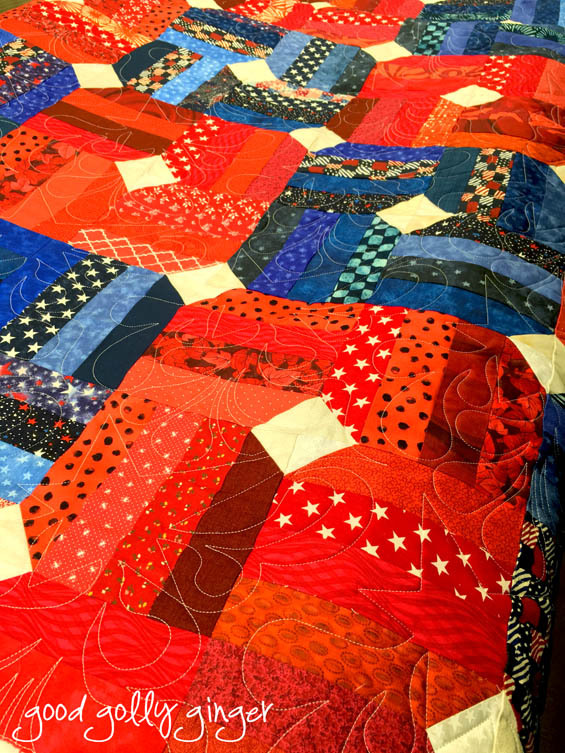 I quilted this quilt with an all-over stars and stripes design. 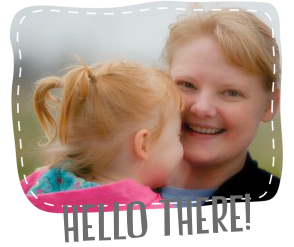 Jennifer made this beauty. I'm sorry now that I did not take a picture of the full quilt. I custom quilted this quilt with feather and rose block designs and three separate borders. 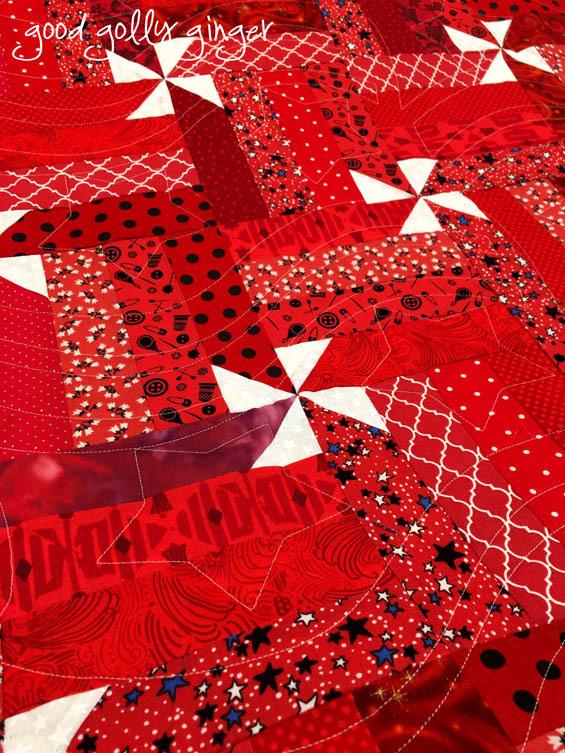 This quilt is the same pattern that the guild used for two quilts, but JoAnn pieced this red and cheery quilt herself. I'm a big fan of red. I quilted it with an all-over stars and stripes motif. JoAnn also made this wonderful log cabin quilt. I found a great log cabin pattern to use that was a feather with a swirl in the center square. 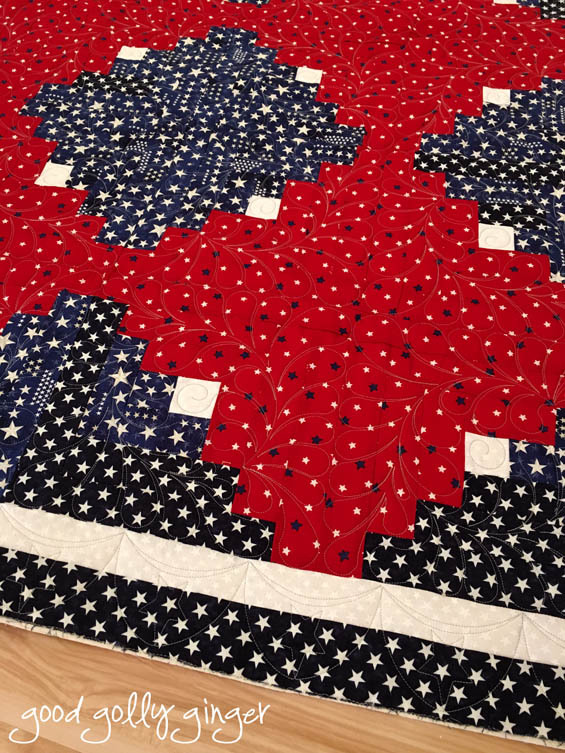 The border was quilted with a patriotic swag. 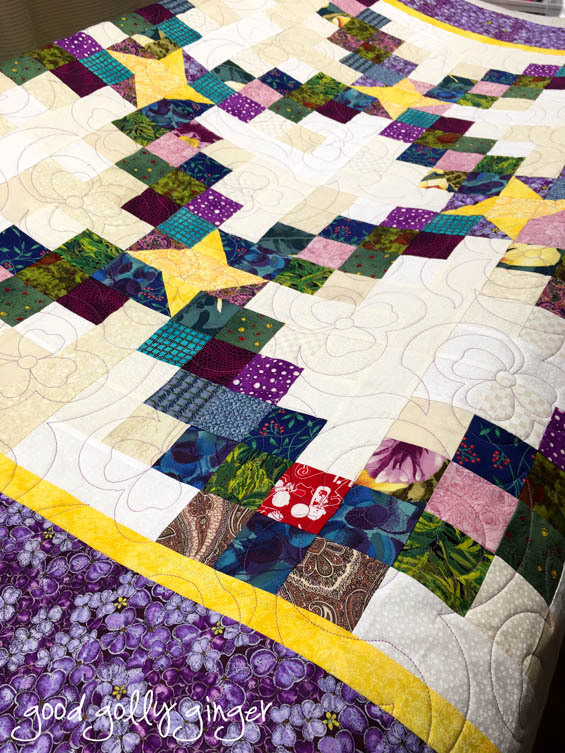 JoAnn also made this beautiful quilt with petal blocks that form large circles without curved piecing. I love that! I quilted it with an all-over modern star pattern. JoAnn and Meda started their own competition to see who could quilt the most. Meda beat JoAnn five quilts to four quilts. Very impressive ladies! The next five dazzling quilts were pieced by Meda. 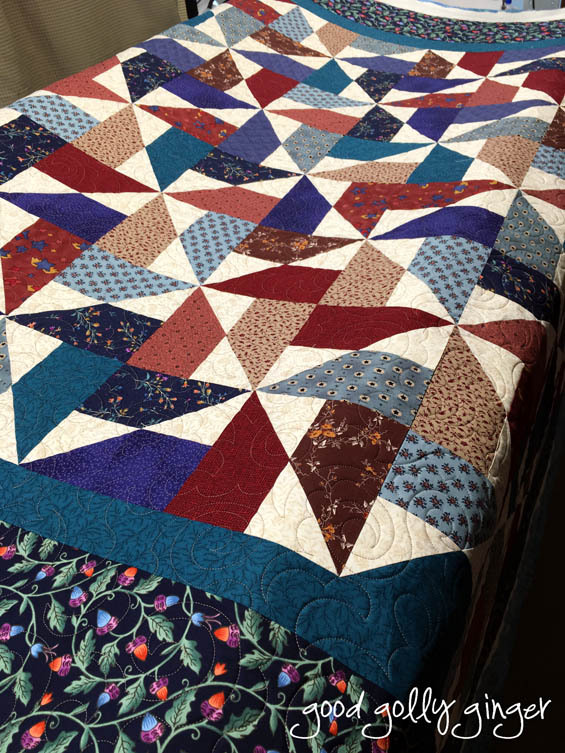 The first quilt, I quilted with an all-over maple leaf design with burnt orange thread. I love the batiks and secondary patterns in this lovely quilt. I never would have guessed how wonderful these colors are together, never in a million years! 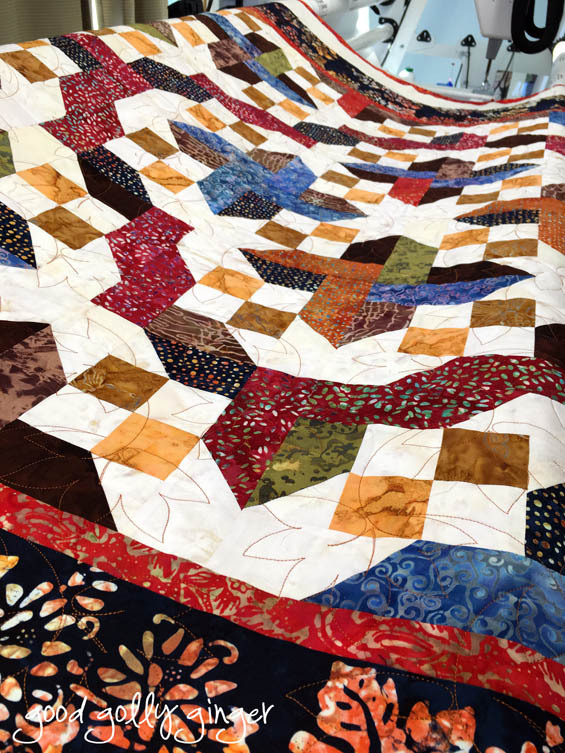 This quilt was quilted with an all-over paisley design with nutmeg color thread. 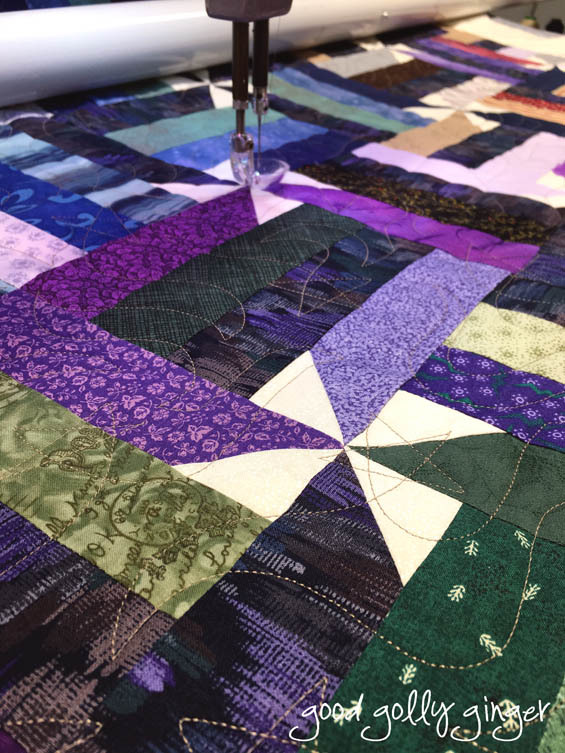 This sweet friendship star quilt was quilted with an all-over clover pattern, echoing the purple clovers in the border. Are they clovers or some other flower? I don't know. I make a terrible gardener. I used lavender color thread. Finally, Meda made this patriotic pinwheel beauty. This quilt was quilted with an all-over scallop and rose design. 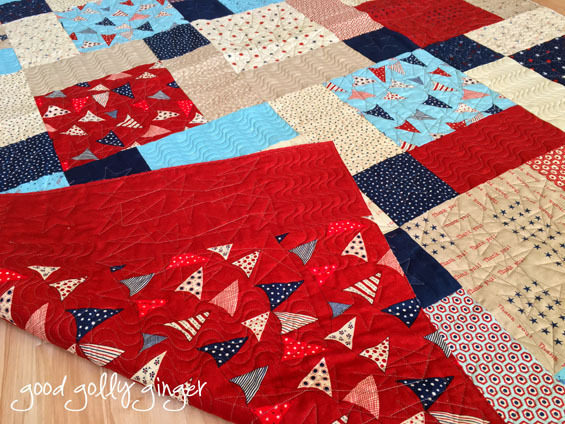 JoAnn made this enjoyable quilt in red, white, and blue. Unfortunately, this photo turned out more yellow than the finished quilt. 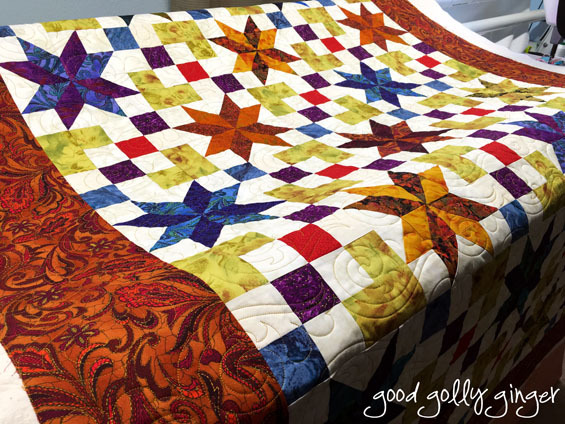 The all-over pattern I used was called gushing star which was perfect for this cheery quilt. The last Quilt of Gratitude was finished by dearest Connie. 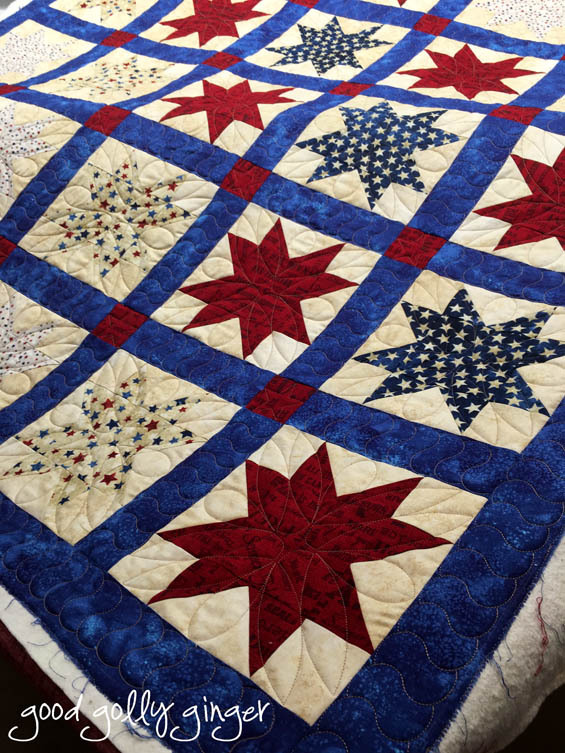 I custom quilted this striking quilt with a traditional flower in the star blocks, rope for the sash, and a patriotic star in the square blocks. It was a pleasure quilting all of these wonderful Quilts of Gratitude. My deepest gratitude to all servicemen and women who have risked their lives for our freedom. I am even more cognizant of the sacrifices made by so many as we approach the anniversary of 9-11. These quilts were displayed in two shows before they were sent to their forever homes. 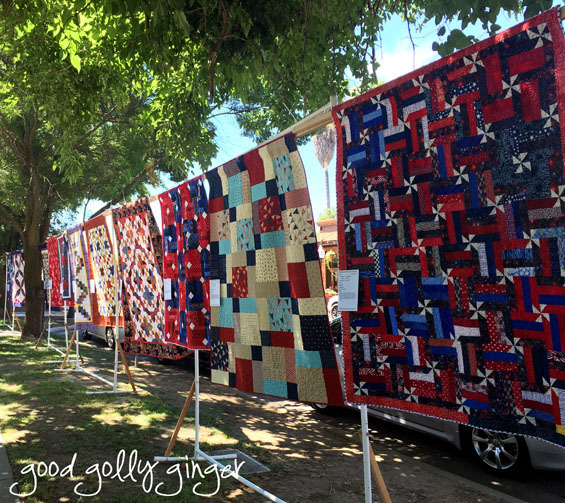 This next photograph is the display at the Winters Outdoor Quilt Festival. Wow! So many beautiful quilts. Love them all. Just think about all the work and unconditional love that went into each of these quilts, and for you to have quilt them all is amazing. What a wonderful project from everyone!